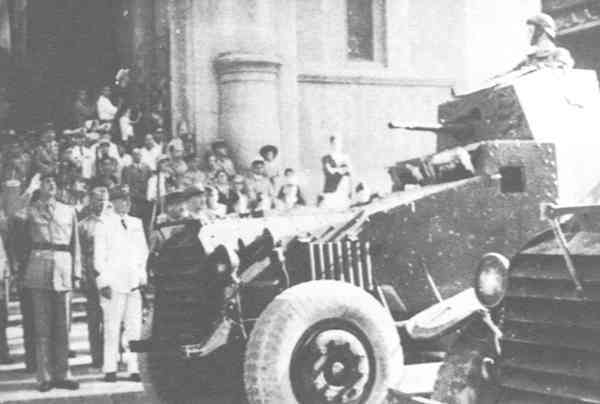 After the conversion of the old White AM armored cars to AMD 50s had started, it was decided that the design had to be improved. The old body of the WWI armored car was modified and mounted on the Laffly LC2 truck chassis. The engine and most mechanical parts were also from the Laffly truck. Nothing of the old White chassis remained, and the name was kept just as a historical reference. This model was considered outdated even when it was commissioned. But, due to the need of armored cars, the conversion process went ahead anyway. AMD stands for “AutoMitrailleuse de Découverte” and it was sometimes referred to as the “Vincennes”. The AMD 80 was characterized by a long wheelbase, and only the rear axle had off-road tires. Its off-road performance, in European conditions, was not amazing, but the vehicle could climb a 40° slope, and cruise at about 80 km/h (50 mph) on the North African roads. The bodywork was conventional, made of 8 mm (0.31 in) plates bolted together to a central frame, with the driving compartment forward and the fighting compartment just behind, with an one-man asymmetric turret housing a 13.2 mm (0.52 in) heavy machine gun, a 7.5 mm (0.29 in) coaxial FM24/29 Fortress type machine gun, and another one at the rear of the turret, firing backwards. There was a small one-piece hatch on top of the turret. Access was granted by two side doors. The driver had sight slits and armoured shutters, and a second one was provided for driving in reverse. Indeed, there were a front & rear driving positions and four gears for each sense, but steering was only applied to the front axle, which required skill to drive backwards at full speed. External storage was provided on the two steps and rear muguards. 28 vehicles were converted in all. The Laffly AMD 80 was used initially in the 6th and 8th Regiments of Cuirassiers. 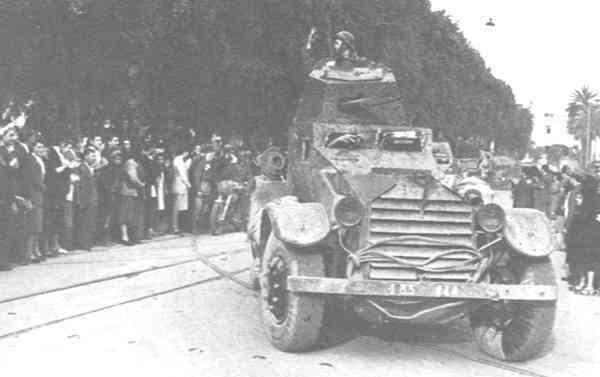 In 1937, this model was replaced by Panhard AMD 178 in these units, and the 27 vehicles still in service were sent to French North Africa, joining the 1st Foreign Cavalry Regiment and the 4th Regiment of Chasseurs d’Afrique. After the 1940 armistice, they were transferred to the 8th Regiment of Chasseurs d’Afrique, but many returned to the 4th Regiment of Chasseurs d’Afrique for a parade in May 1943, marking the victory and the end of the desert war. Laffly-Vincennes of the Chasseurs d’Afrique in Tunisia, 1943. AMD 80 in North Africa.